"There's No Place Like Thorne"
The historic Market Town of Thorne 11 miles northeast of Doncaster, boasts a wealth of attractions for visitors. Access is easy with the M18 / M180 motorways nearby, two railway stations and the Sheffield and South Yorkshire Navigation canal running through the Town. The present day landscape reflects the work of Dutchman Cornelius Vermuyden who transformed thousands of acres of marshes into valuable farmland during the mid 17th Century. Thorne has been called Little Holland, with its flat landscape, big skies, canals and (disused) windmills. The town has a long association with ships and boat building and though the big commercial builders may have gone, there are several thriving marinas, boat yards and boat builders. A "Jewel in the Crown " of the local landscape, the Humberhead Peatlands National Nature Reserve, is a vast area where you can experience wilderness and see rare and beautiful plants, insects, birds and animals from the sundew to fallow deer . However, the old peat workings and ditches contain deep water which together with saturated peat are dangerous so please keep to the paths. You may be lucky enough to see adders , just keep clear of them, and midges and mosquitoes are plentiful during the summer months so take protection. 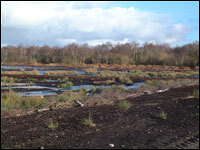 The flat countryside makes for easy walking and Thorne Round Walk is a waymarked route of up to 11.5 miles. The local green-tourism forum is also working on a 45 mile circular route, The Peatlands Way, linking the historic settlements of Thorne, Crowle, Belton, Epworth, Haxey, Wroote, Kirk Bramwith and Sykehouse. Officially opening in July 2002, it also includes the first permissive paths across the internationally renowned Thorne and Hatfield Moors. Also worth a visit Buntings Wood, a recently created Community Woodland near the Canal, picturesque Thorne lock and Thorne Memorial Park where there is a lake suitable for model boats, a miniature steam railway and a bandstand with free brass band concerts on summer Sunday afternoons. Thorne boasts a range of buildings of all ages from fine Georgian residences to unspoilt artisans cottages. Behind the Market Place is the Parish Church of St Nicholas, which has a medieval font and many Norman features. Nearby the former Motte and Bailey Castle dates back to before 1100 and the Keep served as a prison before being demolished in the 17th Century. Known as Peel Hill Motte, this is a prominent local feature. There is an interesting guided walk, Thorne Town Trail, which passes these and many other interesting features. Leaflets on the local footpaths, woods, moors and historic buildings are available free of charge at the Town Council Offices. Tel:(01405) 812092. There is a wide range of accommodation in Thorne and the surrounding area but for a treat try the Belmont Hotel Tel. (01405) 812320. There are all the shops and services you need in Thorne and people come from miles around to use the high quality butchers bakers etc. There is a market four days per week but try to come on a Friday when it is particularly busy and colourful. Lesley Garrett - everyone's favourite opera singer. Professor George Porter - Fellow of the Royal Society. Thomas Crapper - inventor of the W. C.
In addition a world class sculptor, Byron Howard, whose studios are in a former school near the Parish Church, welcomes visitors by appointment Tel. (01405) 816299. There is much to offer the angler too and a minor invasion occurs every weekend. The town has international fame as a venue for some of the biggest events on the fishing calendar reeling in fishermen from far and wide. As well as coarse fishing at The Delves Fishponds, the home of Thorne & District Angling Association (01405) 812491, there's plenty more fishing on the banks of the canal and local rivers. Once the colliery at Moorends was the biggest employer in Thorne. It took 17 years to sink the shaft, commencing in 1909 and it was claimed to be one of the four deepest mines in England, being 3,000ft deep. However the pit, which closed in 1957, was always plagued with flooding and water problems. New shafts were constructed in the 1960s by freezing the ground and futuristic headgear was built. However the pit never reopened and was mothballed, but with its rich ten feet coal seams it is hoped that one day Thorne Colliery will re-open. Recently UK and European funding has encouraged social and economic regeneration to take place through strong local Partnerships. Around 600 people work at the headquarters of Dixons Motors and 200 at BMW's main UK distribution centre, both near M18 Junction 6. With its excellent communications, funding opportunities and a willing workforce, Thorne has become a prime choice for business enterprise.